Newt Gingrich is feeling incredulous. Although there are other nonverbal facial expressions indicating disbelief, the possible 2012 Republican Presidential Candidate gives us a classic and common one. When the central forehead is contracted along with a smile - the emotion is doubt. 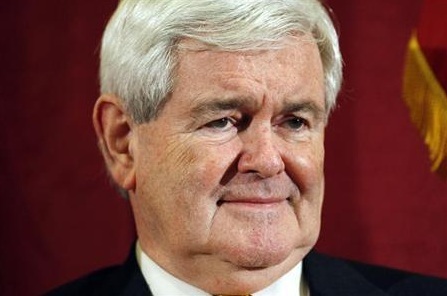 Newt's central forehead contraction is mild and asymmetrical (only on Gingrich's right side) - thus it's more difficult to detect (note there is also a right medial eyebrow elevation). If we saw a video of this moment - it might very well be an example of a microexpression (present for less than 0.5 seconds). Normally when one sees the muscular contraction of the central forehead - there is a simultaneous negative mouth expression - such as fear or sadness. In such a context, it is a body language signal of strong empathy, emotional or physical pain. However when coupled with a smile (and here it is a subtle one) - a red flag should always go up. This is one of many examples of an insincere smile. The former Speaker of the House does not believe what he's hearing or seeing.